Once the smoker has reached the desired temperature, around 125c, add 3 chunks of Weber Firespice Mesquite wood through the front door. Close the door. After 10 minutes, smoke should be visible coming from the top vent. Place the ribs on the cooking grill and close the lid. Cook the ribs for 8-10 hours or until the meat has reached an internal temperature of approximately 87°C. 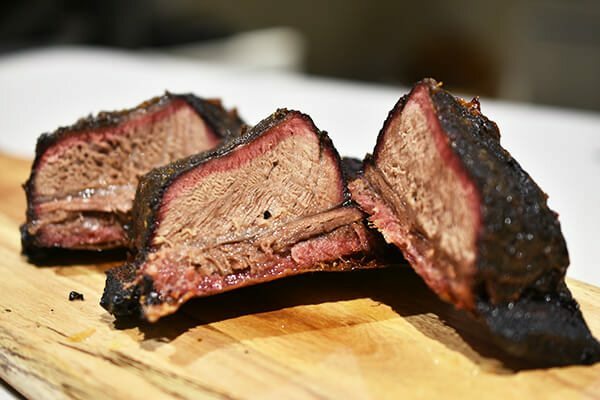 (Note: for longer cooking times like this, remember to check the temperature of the smoker every hour and ensure the water pan does not run dry). While the ribs are cooking, make the glaze. Place the butter in a saucepan and cook over a low heat, until melted. Once the butter has melted, add the onion and garlic. Cook for a few minutes, or until the onion and garlic has softened. Once the onion and garlic are cooked, add the remaining glaze ingredients. Cook, uncovered, for a further 10 minutes over a high heat or until the glaze is thick and sticky, making sure to stir regularly. Remove the glaze from the heat and set aside to cool. Once the glaze has cooled, process in a blender until it is a smooth consistency. Glaze the beef short ribs every 20 minutes for the last hour of cooking. Once the ribs have reached an internal temperature of approximately 95°C, remove them from the smoker. Wrap the ribs in aluminium foil and rest for 30 minutes before slicing and serving.